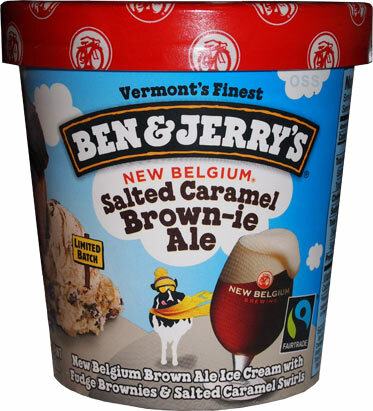 [New for Fall 2015] So back in April, Ben & Jerry's and New Belgium announced that they were making an ice cream inspired Ale. Well, apparently the partnership didn't end there as they have now announced an Ale inspired ice cream with some proceeds going to Protect Our Winters. (click here for the entire press release). Looks good enough but definitely doesn't smell like a regular ice cream. Definitely a faint ale-like smell to it. I scrape the lid and become a little afraid... but press on. Now I know very little of beer, but yeah, this is very beer like. Crud. The swirl isn't strong enough to mask it either. The base has a bit of bitterness to it and the other ingredients just can't override it. Wait, I forgot to add a disclaimer to any new readers: I don't drink. Ever. I just don't. I have had a lone sip of ale and that familiar flavor is what I get here. This was a long shot to start with but I do love Ben & Jerry's and I was willing to risk four bucks on the chance that the ale would compliment instead of override. Well, it overrode. Not terribly mind you, and there isn't some strong alcoholic burn going on, but there's definitely something there. The bitterness is there and the ale vibe lingers long after you are done. So, ale drinkers, this one is all yours. Everyone else, don't expect the caramel swirl to fight the base, it's just not happening here. And the brownies? Delicious, but their flavor is lost as well. On Second Scoop: So I had some with my morning waffle because I was curious to see how I would feel about this one the day after. 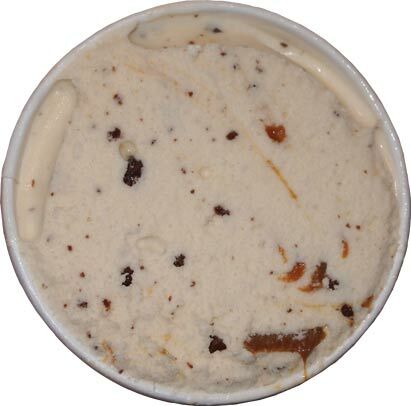 Now I freely admit that if you get a spoonful with a bunch of tasty caramel and one of the huge brownie chunks, then yeah, it makes for an interesting bite. Overall though, this one is aimed for those that enjoy ale or coffee flavors. 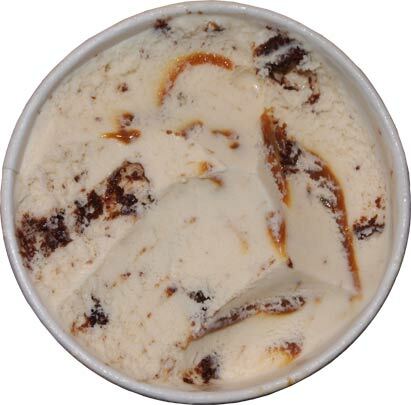 If you've ever had a good coffee caramel brownie ice cream before, than this is fairly similar. So, do you think you will try it? Very disappointed that they chose New Belgium over a plethora of excellent Vermont breweries that would make better partners. "corporate synergy" hehehe. I'm guessing it had to do with size and philosophy, they would want someone big enough to help spread the message but also someone who has a history of commitment to the planet. Just picked up a pint the other day and am loving it! The initial smell was quite...pungent but seems to have dissipated. With the exception of the first eighth or so I haven't gotten really any of the ale flavor, but maybe you're just more attuned to it. Other than occasionally getting a ribbon of caramel that's a little too salty, I'm loving this flavor. Let me say that in the HUGE realm of Ice cream land this flavor is not my overall favorite. This is not one that I could eat every day. That being said, this flavor may be the most perfect flavor I have ever had; And I dislike drinking beer. The flavor balance was spot on. The base was definitely beer, but not over powering or fake. The brownie was soft and just cake-like enough to pair with the very creamy base and lastly the delicious PUDDLES of salted Caramel complete the balancing act. Not too sweet nor salty. I added bacon last night and ate a KK salted caramel doughnut. Whoaaa, it was excellent. Execution was perfect. I don't consider beer a beverage, but I like cooking with it, so I'd give it a chance. I have no interest in this flavor but I did see it at Shaws/star market in mass. 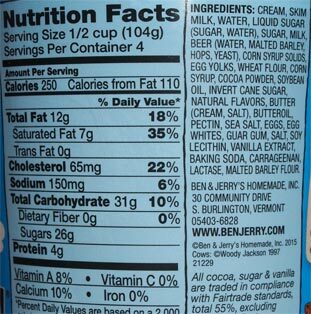 Also tip...this week, Ben and jerrys is buy two, get two free there, so it comes out to $2.15 per pint which is the best deal I've seen for this ice cream in years. funny, i got a bunch for $2.50 a pint at Shaws not too long ago. Hey everyone, I have something I want to share. I know a lot of you think I'm a little crazy for not liking this one, and that's fine. I just want you to listen to my thoughts, I never said you had to agree with them. That said, I would like you to think of something. While you may find this flavor awesome, is it universally awesome? When a flavor really hits a wide ranging fan base, it disappears from shelves. It's not just hard to find, it's hard to stay stocked. While my local freezer aisles seemed to be the last to get this one, they all still have it now. Every single place that carries this, still carries it. My local walmart often gets wiped out, but you'll still a bunch of Brown-ie Ale to the side. So while social media lets me know there are fans of this one, I just don't think it's selling that well. I agree with you. You know how certain Restaurants are a "Destination" restaurant? Same principal goes here. This is not a daily go-to ice cream. This is a special scoop, an "I'm in the mood for this particular flavor profile" scoop. While I do think it's the most perfectly balanced Ice Cream I've ever had I know that the flavor will be a memory. It's not one that I see being kept on shelves. I've purchased a few and my scoop has become more of a spoonful to savor so I can make it last. I will say that I've gone on about this flavor to friends and family and they all have absolutely loved it. Again, it's not your weekly bowl....it's more a vacation. Merry Christmas! @Jeremy: Well said! And Merry Christmas to you too! Sorry but I think your review is a little worthless if you don't like Belgium Ales in the first place. 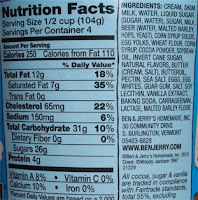 I hate mint flavored things how good do you think my review would be if I reviewed a pint of mint choc chip ice cream? I do however absolutely love Belgium Ales and this ice cream is with out a shout of a doubt amazing... Beer flavor and all. Ben and Jerry's nailed it. BAHAHAHAHAAHAHAHA, man, it's the review that wouldn't die. Everyone who loves this flavor is always offended by this review, but please realize something. Like you, I am just one person. Our lone opinions don't matter. What does matter is that this flavor has sold really poorly because that Ale flavor ruins it for the majority of people. I'm glad you enjoyed it, I have no problem with people enjoying it, I'm just trying to help everyone see the bigger picture.